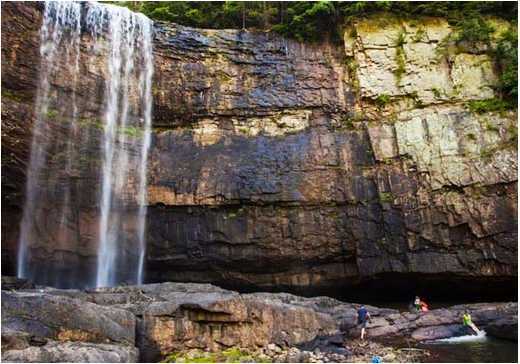 To experience one of the most scenic locations in the Chattanooga area, it pays to plan ahead. The Lula Lake Land Trust has breathtaking views around most every corner and over six miles of trails, making it a prime destination for a great trail run, hike or bike. However, the property is open to the public only on the first and last Saturday of each month, excluding certain holidays. But plan your trip accordingly to plan a visit—you’ll be glad you did. The land trust was created to preserve “natural and historic landscapes through conservation, education, and low impact recreation." The most common way to experience Lula Lake is with a leisurely hike or picnic with family or friends. When hiking at Lula Lake, there are three must-see locations. The first is the upper falls and Lula Lake itself, viewed from an old railroad bed dating back to the 1800s. This lake is as picture-perfect as they come with a small waterfall feeding into brilliant turquoise waters. The second location is the lower falls, best viewed from the bottom after descending a steep and rugged trail. This path is not for the very young or frail, but the sight of the falls dropping nearly 100 feet into a huge basin makes it worth the effort. A final must-see location is the panoramic vista from the shaded, grassy east brow of the mountain. The route to the top is either a gravel road or hiking trail, both with moderate climbs, but the overlook of the Chattanooga Valley provides ample reward. Most anyone capable of a short hike can find something to like about Lula Lake. If you can handle a brisk uphill or two, you just may find yourself in love. 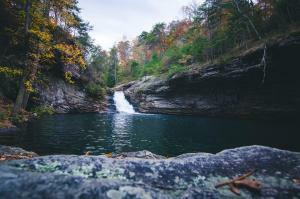 Lula Lake is only 30 minutes from Chattanooga on the eastern edge of Lookout Mountain. Beginning February 23, 2019, Open Gate Days will be reservation-based. Reservations will be made on a first come, first served basis and include access to everything Lula Lake has to offer. There is a $15 per car "conservation use fee" and 100% of the proceeds go back into the preservation of Lula Lake. The new reservation system helps LLLT focus on their goal of maintaining the tranquility of nature. 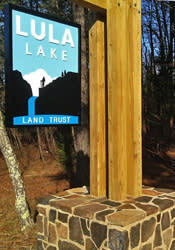 For more information on Lula Lake Land Trust, a schedule of open gate days and events, and to make reservations, visit the Land Trust’s website, which includes a trail map.